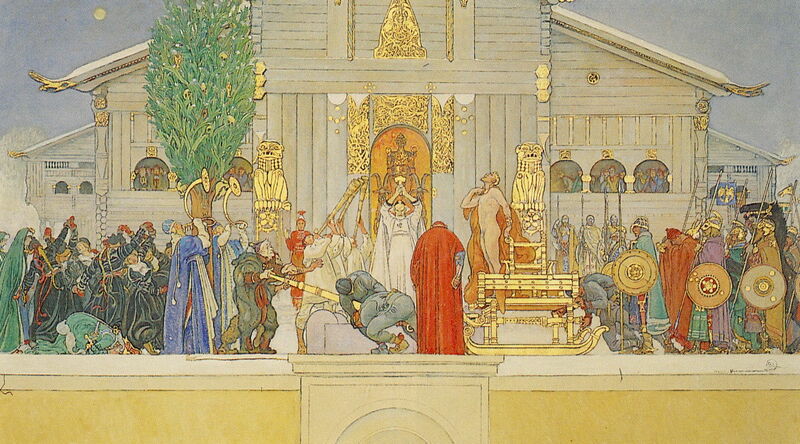 Carl Larsson (1853–1919), Midvinterblot (Midwinter's Sacrifice) (detail) (1914-15), oil on canvas, 640 x 1360 cm, Nationalmuseum Stockholm. Wikimedia Commons. A century ago, in 1915, much of Europe was engaged in one of the greatest and most senseless slaughters in recorded history. Poison gas had been used in the Second Battle of Ypres, and the trenches were filling with corpses. Around half a million troops died on the Gallipoli Peninsula in Turkey. Those who could still care about art were being shocked by Cubists such as Picasso, Braque, and Juan Gris, and developments by Jean Metzinger, Albert Gleizes, and Robert Delaunay. The Nordic countries managed to remain neutral, but British and German naval activity in the Baltic was a reminder that the war was not far away. 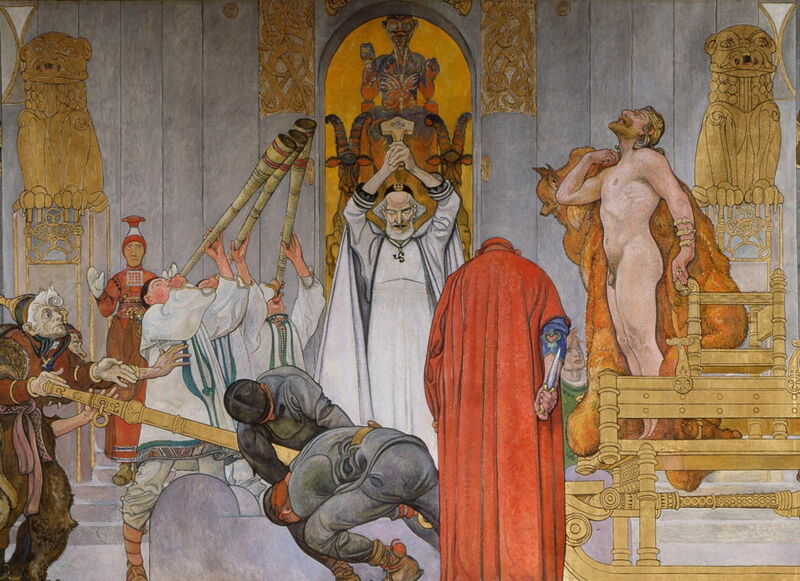 Nordic culture and politics were developing increasingly independently: in Finland the publication of the Kalevala in 1835-49 inspired Akseli Gallen-Kallela‘s spectacular Aino Triptych (1891), and Finland finally achieved independence from being an autonomous Grand Duchy in the Russian Empire in 1917. 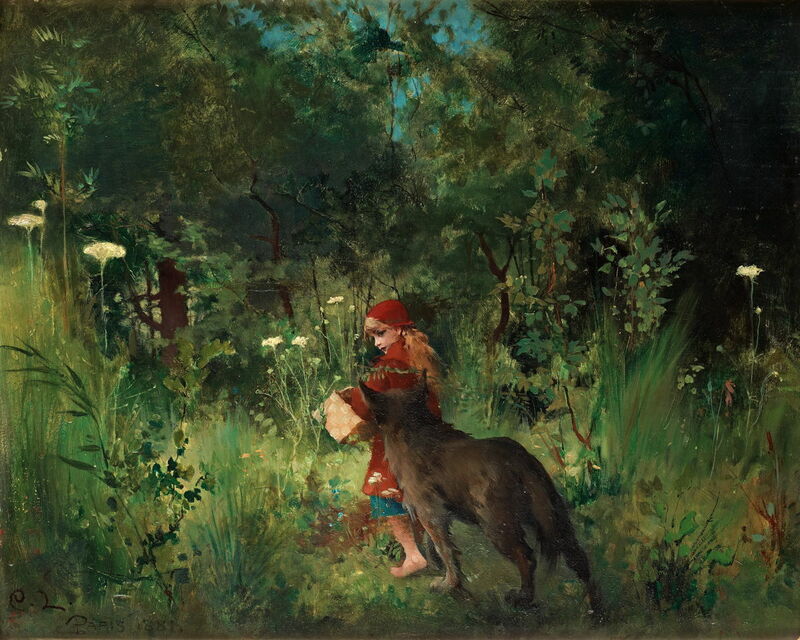 In Sweden, painters such as Anders Zorn, Carl Larsson, and Bruno Liljefors were documenting country life and nature in realistic style, often associated with the national crafts movement. Carl Larsson was born in humble and poor circumstances in Stockholm. He showed early drawing skills, and gained a place at the Royal Swedish Academy of Arts, where he flourished, earning a medal in life drawing. He worked as a caricaturist for a newspaper and a graphic artist for another, and was able to support his parents financially. He also illustrated books and magazines. In 1877 he moved to Paris, where he avoided the Impressionists, and met with little success. He returned to Sweden the following year, then went back to France in 1880. He spent two summers painting plein air in the Barbizon area and Fontainebleau, and in 1882 joined the artists’ colony at Grez-sur-Loing. There he met, and later married, the artist Karin Bergöö, and became accomplished in watercolours. The family moved back to Sweden in 1885, where from 1888 they lived in Sundborn, Dalarna (where his house is a museum during the summer). His illustrated book A Home became popular when it was published in Sweden in 1899, and he met even greater success with The House in the Sun (1909), published in Germany. He continued to paint in oils too, and was commissioned to produce a suite of murals for the walls of the central staircase in the National Museum in Stockholm, depicting motifs from Swedish history. The first of these was completed in 1896, and in 1907 he completed Gustav Vasa’s procession into Stockholm, 1523 (1907), which was hung like the others in the museum. The last, and what he intended to be his greatest, mural is drawn from the mythical sagas of the Icelandic writer Snorri Sturluson, with additional material from Adam of Bremen. Larsson wanted it to form a contrast with the other murals which he had already painted. 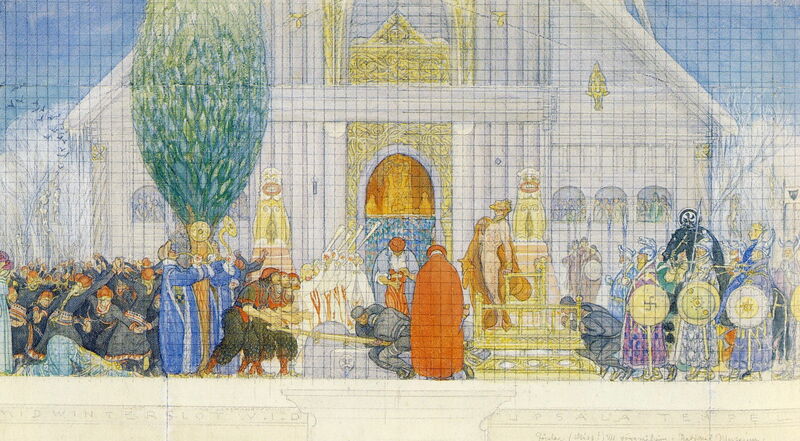 Carl Larsson (1853–1919), Preparatory sketch for Midvinterblot (Midwinter’s Sacrifice) (1910), graphite on paper, 29 x 59 cm, Nationalmuseum Stockholm. Wikimedia Commons. The style shows art nouveau influence, and in its gilding and decoration is reminiscent of Gustav Klimt, a contemporary who died in 1918. Larsson made a preparatory sketch in 1910, which he then turned into a painted study (since lost) and displayed in the National Museum. Early harsh criticism was made of anachronisms, particularly in dress. 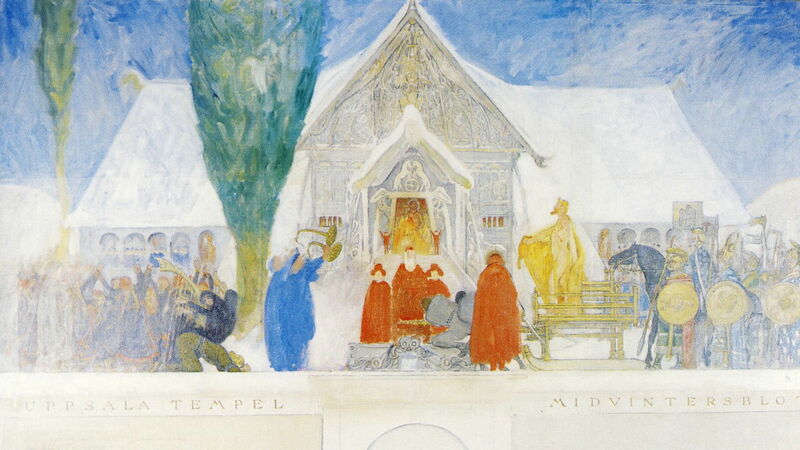 Carl Larsson (1853–1919), Preparatory study 1 for Midvinterblot (Midwinter’s Sacrifice) (1913), oil on canvas, 202 x 341 cm, Nationalmuseum Stockholm. Wikimedia Commons. Larsson made two further preparatory studies in 1913, in which he achieved a more monumental composition, and the painting took on the appearance of a frieze. Carl Larsson (1853–1919), Preparatory study 2 for Midvinterblot (Midwinter’s Sacrifice) (1913), graphite and gouache on paper, 44.5 x 78 cm, Nationalmuseum Stockholm. Wikimedia Commons. These again attracted harsh criticism, on his choice of subject and its presentation. It was felt to be unreal, unbelievable, and irrelevant for modern Swedish people. The museum board accepted the painting, but on condition that Larsson made changes, particularly to remove the ritual killing scene. Larsson refused to accept the changes, and resigned from the task in 1914. However, later that year he resumed work, completing a life study for the figure of the king, and preparing another study. Debate continued in the newspapers, and involved government ministers. More recently it has been proposed that the underlying problem with the painting was that it failed to meet the modernist ideals of Sweden in the early twentieth century. 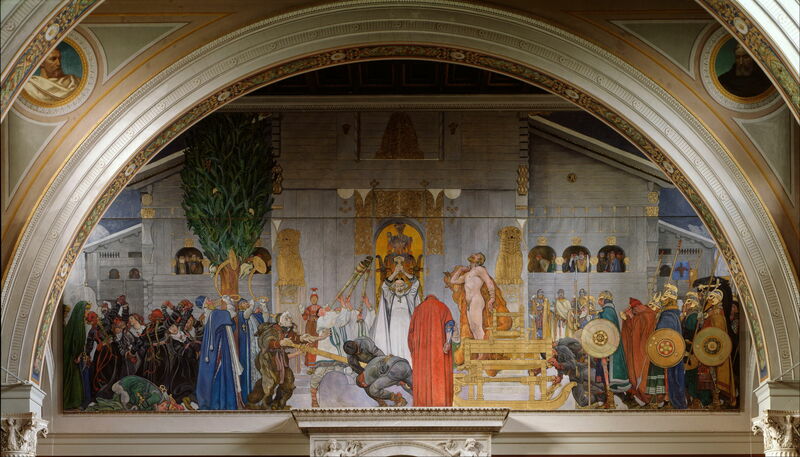 Larsson completed the massive painting, and it was exhibited where it was intended to go in June 1915, before being rejected and removed. The artist died in 1919, just after the end of the war, and remained bitter about the whole matter. His painting was shown again at the National Museum between 1925-1933, but once again removed. In 1983-4, the painting was exhibited in the Museum of National Antiquities. It was first offered to the National Museum, which again declined, and the Museum of National Antiquities was unable to pay the asking price for it. It was sold to a private collector in Japan in 1987, from auction at Sotheby’s, only to be loaned back for the National Museum’s bicentennial celebrations in 1992. Since then it has remained there, at first on loan, but in 1997 it was finally purchased by the museum and installed where it had originally been intended. At least, in using conventional means of expression, there was little doubt over Larsson’s meaning. Perhaps the image of a king giving his life to save his people was a little close for comfort. Gunnarsson T (ed.) (1992) Carl Larsson, Nationalmuseum och Göteborgs Konstmuseum, Stockholm. ISBN 91 7024 764 1. Carl Larsson’s less controversial paintings remain very popular, featuring in many calendars, and his books are still in print, and available in English. Posted in General, Painting and tagged art nouveau, Cubism, Finland, Gallen-Kallela, Klimt, Larsson, myth, painting, Sweden, World War, Zorn. Bookmark the permalink.